50% advance to be taken before group arrival which is not refundable. 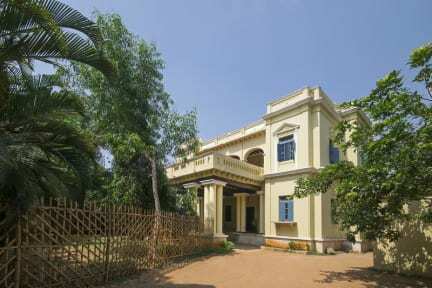 'The Mansion', as the name suggests was built as a big residence for a well known businessman more than a 100 years ago in 1907. 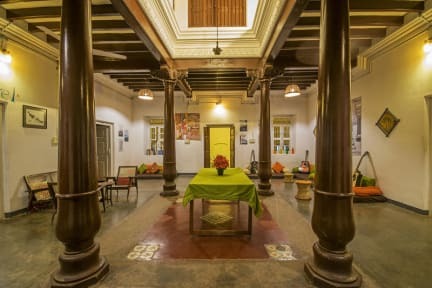 The property that boasts of beautiful columns and wood work is a mixture of Indian and British architecture. Since it is built according to the Indian science of architecture 'Vaastu' it utilizes the space, air and light to the maximum. The Property now redone with a modern touch has a very unique ambiance that cannot be described and must be experienced first hand. Large common spaces and balconies surrounded by dorms and private rooms of various categories provide the setting for a perfect hostel. Free spirited travellers from all over the world add to the amazing energy of the space. Namaste The Mainson Family! What a beautiful experience. Nice place to chill, to meet people and also to stay quiet and within yourself if you are on the mood. The location is right in the city center, staff always helpful and kind. Lakshimi runs the kitchen pretty well and kindly. And Stonie (dog) takes care of us all with all her love. Beds were comfortable and bathrooms clean. And the house itself is super nice and feels like home.